The West Bengal Public Service Commission will hold the West Bengal Civil Service (Exe) etc. 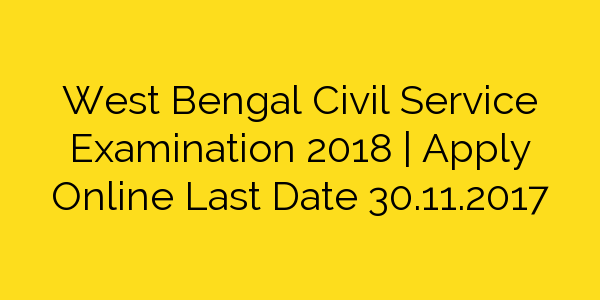 Examination, 2018 on the results of which recruitment to the West Bengal Civil Service (Exe.) and certain other services. How to Apply: Apply Online a West Bengal PSC recruitment website https://www.pscwbonline.gov.in from 10/11/2017 to 30/11/2017 only. West Bengal Public Service Commission will hold the West Bengal Civil Service (Exe) etc. 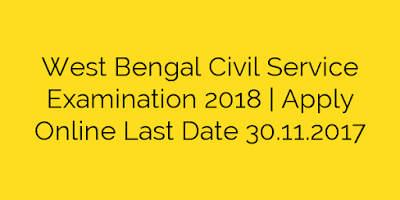 Examination, 2018 on the results of which recruitment to the West Bengal Civil Service (Exe.) and certain other services. This examination is very tough and lots of people try to give this exam. The students must apply for this examination and you share the good information with the students. You define everything about this examination and I really like it. Its really progressive and I liked your post.This site always share something good for people.Thanks for sharing.Good luck to all applicants.